How do you think Carnivore in Oak Park compares with Homestead Meats in Evanston? The only problem is the home equity loan I have to take out to afford to buy there. Santander wrote: Living in Oak Park and singing regularly in Evanston (I spend an inordinate amount of time stuck on Lake Shore Drive), the highlights for me up north are in no particular order: Kuni's for hot towel and chutoro and agedashi tofu, Cross-Rhodes for Greek fries, Union Pizza for mixed drinks and lamb sausage pie, Edzo's for burgers, and now Peppercorn's for bubble tea and cumin lamb. That Dollop / Hoosier Mama locale seems to be going downhill to me (soggy off-flavor sweet pies, though hand pies are still good) though I like the wide hours. I think each example here is slightly better than or missing from comparative Oak Park selections (Sen Sushi, Papaspiros Greek, any thin pizza place in OP proper, Scratch for burgers, current Katy's iteration for Szechuan, Sugar Fixe or Spilt Milk for bakery-coffee combo). Carnivore is a best of breed for me right in Oak Park, and when Taste of Brazil comes back I'll be there day one, and I'm really quite fine with Maya del Sol and Altiro at least for margaritas and appetizers, and Saigon Pho for papaya salad and Lola Tining’s for halo halo. But if you're willing to cross streets, Gaetano's and Heritage and Axcan and Autre Monde (haven't visited this year though, have seen a slide mentioned here) and Freddy's and Johnnie's and Alpine and Cigars & Stripes and Big Guys and La Quebrada and La Parrillita (and Mr. D's and Pollo Vagabundo for slight stretches) are all more excellent for certain items than anything in Oak Park proper or (debatably) than I've found in or within a few minutes of Evanston. For me, these are both self-proclaimed bastions for which the surrounding landscape actually has more treasures. Thanks--these and other comments are great. I have more experience with Evanston, but increasingly hear the comparison with OP. I tend to lump Forest Park in with "Oak Park." Oak Park itself is much smaller than Evanston. I wouldn't choose one or the other over just food. They are quite different communities really. Not at the top of our list but good food and drinks. We are there occasionally after a movie at the Lake. bobbywal wrote: I made a spur of the moment stop at Food Obsession after a band event. Service was friendly, they comped us an order of the fries for seemingly no reason - they were delicious. I got the fish tacos, which I'd order again. Good asian-inspired flavors. My daughter enjoyed her sliders. Beer was good. One pet peeve is that I can't keep track of their hours. I drive by often and are surprised to notice that they are closed during times I'd think they'd do a fine business. Last edited by Panther in the Den on March 27th, 2018, 12:45 pm, edited 1 time in total. Vitesse98 wrote: My daughter took a camp at the chef's Food Obsession catering shop on south, and honestly I loved everything they all devised under his guidance. I hope some of his Korean ideas wind their way into whatever he is up to in the former Kinderhook spot. Driving by today the South Blvd location and I noticed the windows were papered over (equipment I'll inside). Poke Burrito coming in May or June to the space vacated by the creperie, Purée Kafe AKA: Atlas Kafe. I liked their Turkish coffee. For a while they had designs to move into a storefront on Madison just east of KFC but that never materialized. ......All in all a very good meal for opening day. Not surprised though as talking with the hostess/casher this is another store by the owner of North Ave Falafel at North and Oak Park. Interesting, since the first few times I had been to North Ave Falafel it was completely underwhelming and I have not been back. Has any one been lately? Maybe it has improved. Petra Falafel has a nice vibe, in part because that room itself is an interesting buildout of Victorian shop with lots of detail remaining. 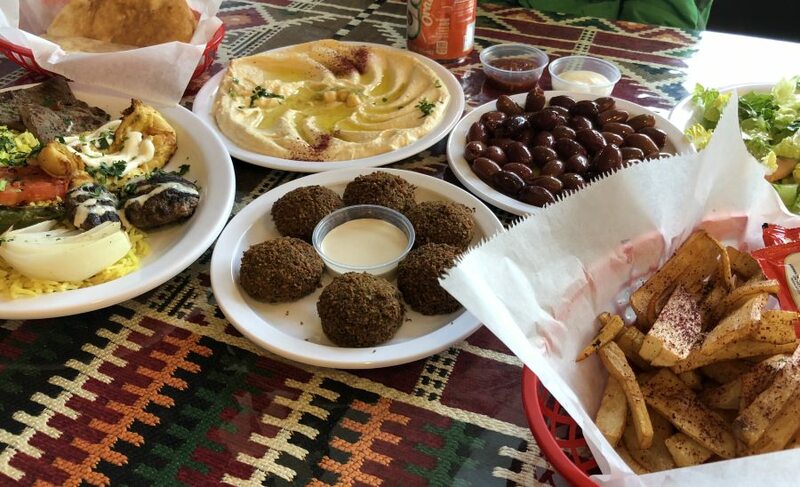 The falafel and particularly the hummus were excellent, and they poured some of their pride and joy olive oil on the olives. Unfortunately the meats were all holdovers and as tough as leather - steak, chicken, and off-flavor kofta. The sumac fries have strong potential but were not cooked through. They were advertising for a new chef and I hope they find one, though the owner does know his chickpeas. Panther in the Den wrote: ......All in all a very good meal for opening day. Not surprised though as talking with the hostess/casher this is another store by the owner of North Ave Falafel at North and Oak Park. Unfortunately the meats were all holdovers and as tough as leather - steak, chicken, and off-flavor kofta. The sumac fries have strong potential but were not cooked through. They were advertising for a new chef and I hope they find one, though the owner does know his chickpeas. I am always worried when I see the spit and not a lot of business. I was lucky (in this rare case) to be able to visit on the opening day. I saw some praise for Amerikas two pages back, but I went there with a party of 4 at 6pm on Saturday and wanted to say that everyone loved it. We split 6 items and 2 deserts, all of which were fantastic. The place really filled up during the 90 minutes we were there, and I'm glad to see that business was doing well as I hope to make it a staple in my Oak Park rotation. Standouts were the octopus and cauliflower dishes. I got a falafel sandwich from Petra a couple of weeks ago. It was fine, but I was thrown off by the fact that it appeared to be served rolled in a flour tortilla, burrito-style, and not in a pita, which is what I was expecting (and not what was pictured on the menu). What's up with that? Vitesse98 wrote: I got a falafel sandwich from Petra a couple of weeks ago. It was fine, but I was thrown off by the fact that it appeared to be served rolled in a flour tortilla, burrito-style, and not in a pita, which is what I was expecting (and not what was pictured on the menu). What's up with that? Depending on the region, Lebanese style pita sandwiches are made this way with thin pitas rolled as opposed to pita pockets. I believe it. 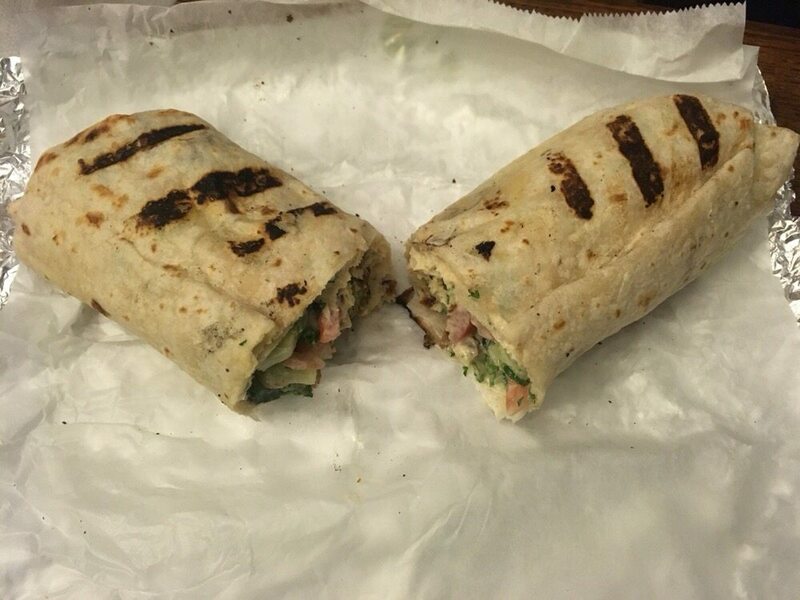 I was just surprised, because it looked and tasted not like a flatbread but exactly like a flour tortilla, and was folded, rolled and wrapped just like a burrito. I don't think I've ever had a falafel sandwich in anything but a pita. It is in the location of the shuttered Eyrie which was part of Robert Morris University's culinary school. Open, drove by yesterday and it was busy. teatpuller wrote: I tend to lump Forest Park in with "Oak Park." Oak Park itself is much smaller than Evanston. I wouldn't choose one or the other over just food. They are quite different communities really. The sticky part of this belief is that Oak Park and Forest Park were poles apart when they were founded. Oak Park was the 'restrained, reserved' town, where you might be able to have a glass of wine if you found the correct venue. Forest Park was the 'rock-em-sock-em WET' town where you could have wine, spirits, and beer just about everywhere. This extends to the 21st Century. It is one of my favorite suburbs due to its proximity to the CTA Blue Line “L”. Lunch at Obsessed Kitchen yesterday was beyond disappointing. We live nearby and although Kinderhook wasn't anything groundbreaking, it was nice to have a place to walk to for a burger and a beer. We were glad to see another restaurant taking over the space and were hoping that Obsessed would be at least decent. My husband and I gave it a try when it first opened and were disappointed. We had hopes though that maybe once they got up and running it would improve. We noticed a sign touting a new menu and new cocktails so thought it might be time to give it another chance. I ordered a Warm Farro Bowl. Fifteen bucks for an unseasoned bowl of farro. It was supposed to have seasonal vegetables. I should have asked what vegetables would top the bowl, but I assumed that seasonal meant it would at least be fresh veg. Instead, it had carrots, yellow squash and zucchini that tasted as if they were straight from a bag out of the freezer. A little pesto, a poached egg on top, but again, not one bit of seasoning. It was the kind of meal that just made me sad. My husbands burger wasn't much better - over cooked and under seasoned. Fries were ok. Sad to say we won't be going back. 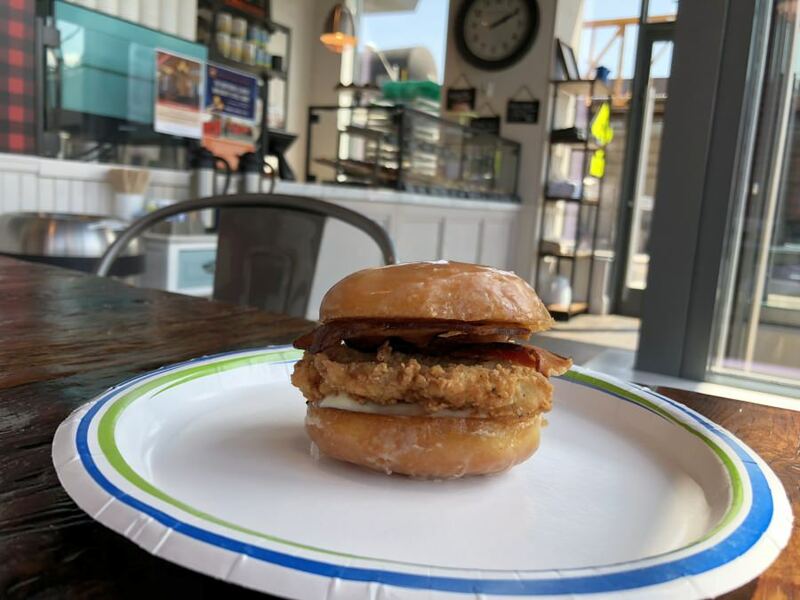 The maple bacon chicken donut slider is $2.95, and intriguingly composed - fresh fried chicken on a split plain donut (their dough is less sweet and more bready than your usual fried ring of delight), with the maple cream and excellent smoky bacon added after. The donut case is very pretty - bright colors, inventive combinations. I like the concept of the malted milk ball holes better than the final execution where all of the malt flavor is in a crispy disk on top. I've had the cold brew and the nitro coffees and prefer the former slightly. Promised My Bride a great burger for lunch and when we ran out of time for Plan A I had a bit of a panic for an alternative. After trying it myself a while back based on a few recommendations here. Did the job. She traditionally eats light and only ate half at lunch but it stuck in her mind and she just finished the other half for a late night snack. "How much extra would it be to make it a meal (IE: Add fries and a drink)?" At first I had to repeat it twice after he said "Huh? ", then twice he said "$16.42", then he said "Take the Cheeseburger Meal and add $0.50.". Still not answering my question. Finally I said forget it and just give me the burgers with a grunt he voided the order and re-entered it, shouted to the grill "Cancel that order!". The real name is Billy Bricks. My Bride and I are battling a summer cold and rather than make our beloved and monthly Masaman Chicken we decided to order in. I went over, placed the order for carry out and waited. A good way to enjoy the ambiance. Paint still fresh and explanatory posters on the wall. Good sized with a bench along one wall with smaller tables. Bigger tables in the center. I was prepared to have some grief over my typical Chicago order, cheese and sausage but the gal didn’t blink and asked whether I wanted spicy or mild sausage. 10 minutes! from order to delivery to my table. Sounds about right for a 12” in a 800+ degree wood fired oven (no wood smoke odor). Took it straight home and dug in, very thin crust a little limp, sauce a little tangy and the cheese and sausage lost. From the 12” pizza there was 10” with toppings but not to fret as the crust was fine to snack on on its own. Not highly impressed, I would prefer Flapjack Brewery and I know a few other restaurants in the area are doing something similar. Nonna D’s on Roosevelt might also have them beat. Nothing really bad though as to get a true representation of their wares might be in one of their specialty combinations. That crust was really good! Maybe a cup of sauce for dunking? The Chicken Enchilada soup (1 of 3) was also very good! I think you nailed it. Harmless, and something I would eat if put in front of me, but the whole thing felt like someone was rushing the be the first to IPO as the Chipotle of Neapolitan pizza. Flapjacks is better south, and Forno Rosso to the north. Thirded. Pies at Coalfire / Stop 50 prices without approaching the quality or imagination, and really not any larger. Inoffensive and unambitious like most of The People's Village. Partner with Carnivore and get some good meats, wouldya. I would much rather have had a Blaze, which is literally half the price for a build-your-own, and for which I am a sincere apologist. Flapjack Brewery is an exciting development. Even better than the pizzas so far is the wood fired muffuletta. Panther in the Den wrote: The real name is Billy Bricks. They opened one of these in Mount Prospect in the building with the Ice Arena, in the middle of a light industrial park. The best thing I could say about them was that it was fast. There was nothing particularly wrong, but it failed entirely to excite the way pizza should. I've had thin crust (non-wood fired) from Mug's and Lou Malnati's in the last couple weeks, and both have aspects that make me say, "oh, yeah, pizza! Let's have another piece." With Brick's it was just fuel. The "Meal Deals" which include fresh made fries and a drink are listed on the wall menu along with the other men items. Merkt's, burger I believe is $4.69 or $7.19 for the Meal Deal. Ordered individually would be, $8.37.